Don't you wish that you know a second language other than your own native tongue? There is a growing number of people around the world that have become interested in learning the Korean language or alphabet (called Hangul). Chinese writing has been known in Korea for over 2,000 years. It was used widely during the Chinese occupation of northern Korea from 108 BC to 313 AD. By the 5th century AD, the Koreans were starting to write in Classical Chinese - the earliest known example of this dates from 414 AD. They later devised three different systems for writing Korean with Chinese characters: Hyangchal (향찰/鄕札), Gukyeol (구결/口訣) and Idu (이두/吏讀). These systems were similar to those developed in Japan and were probably used as models by the Japanese. The Idu system used a combination of Chinese characters together with special symbols to indicate Korean verb endings and other grammatical markers, and was used to in official and private documents for many centuries. The Hyangchal system used Chinese characters to represent all the sounds of Korean and was used mainly to write poetry. The Koreans borrowed a huge number of Chinese words, gave Korean readings and/or meanings to some of the Chinese characters and also invented about 150 new characters, most of which are rare or used mainly for personal or place names. The Korean alphabet was invented in 1444 and promulgated it in 1446 during the reign of King Sejong (r.1418-1450), the fourth king of the Joseon Dynasty. The alphabet was originally called Hunmin jeongeum, or "The correct sounds for the instruction of the people", but has also been known as Eonmeun (vulgar script) and Gukmeun (national writing). The modern name for the alphabet, Hangeul, was coined by a Korean linguist called Ju Si-gyeong (1876-1914). In North Korea the alphabet is known as 조선글 (josoen guel). The shapes of the consonants are based on the shape the mouth made when the corresponding sound is made, and the traditional direction of writing (vertically from right to left) most likely came from Chinese, as did the practice of writing syllables in blocks. Even after the invention of the Korean alphabet, most Koreans who could write continued to write either in Classical Chinese or in Korean using the Gukyeol or Idu systems. 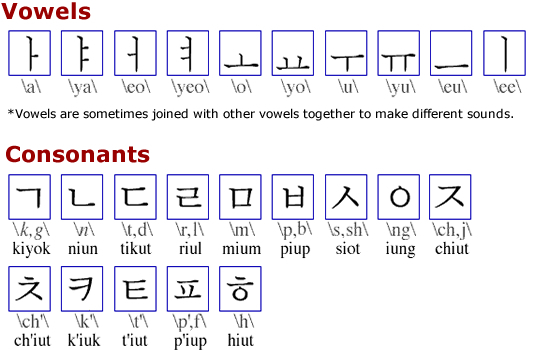 The Korean alphabet was associated with people of low status, i.e. women, children and the uneducated. During the 19th and 20th centuries a mixed writing system combining Chinese characters (Hanja) and Hangeul became increasingly popular. Since 1945 however, the importance of Chinese characters in Korean writing has diminished significantly. Since 1949 hanja have not been used at all in any North Korean publications, with the exception of a few textbooks and specialized books. In the late 1960s the teaching ofhanja was reintroduced in North Korean schools however and school children are expected to learn 2,000 characters by the end of high school. In South Korea school children are expected to learn 1,800 hanja by the end of high school. The proportion of hanja used in Korean texts varies greatly from writer to writer and there is considerable public debate about the role of hanja in Korean writing. Most modern Korean literature and informal writing is written entirely in hangeul, however academic papers and official documents tend to be written in a mixture of hangeul andhanja. Today most people only speakone main language while doing business. The universal way in any language (including Korean) to show your appreciation in business would be thru corporate gifts. The ultimate representation of this type of gift would be thought of as corporate awards that are given. These types of gifts would truly be a great honor to receive in any language throughout the world.